TORRANCE, CA—Whether it’s the right lighting, carefully curated music, or a signature scent, hotels are keenly focused on creating the ideal environment for a guest’s comfort and relaxation during the stay. 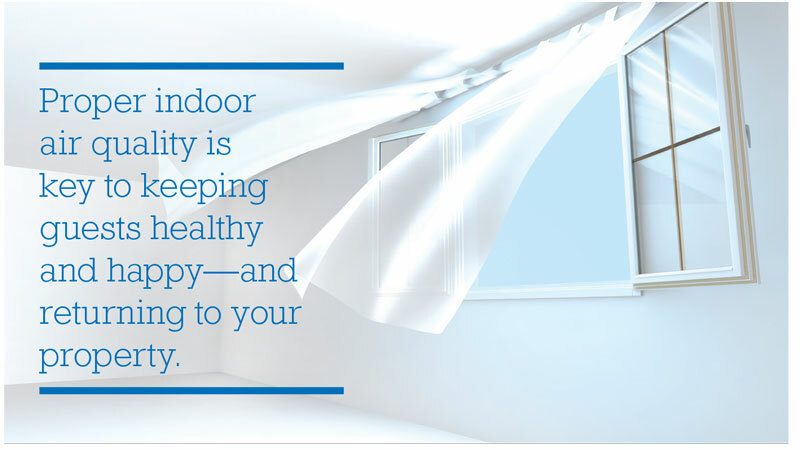 Indoor air quality (IAQ) is just as important. Studies of human exposure to air pollutants indicate that indoor levels of pollutants may be two to five times—and, occasionally, more than 100 times—higher than outdoor levels, according to the U.S. Environmental Protection Agency (EPA). Since most people spend about 90% of their time indoors, these levels of indoor air pollutants are of particular concern. It’s about more than breathing easy. The EPA noted that, in rarer cases, there’s the potential for life-threatening conditions such as Legionnaires’ disease or carbon-monoxide poisoning. In a hotel setting, perception is reality, and hotels must manage that perception from when the customer checks in until they check out, urged Jelin. “Even minor issues with IAQ can negatively affect customer perception, which may damage a company’s brand and lead to poor customer retention,” he said. In business for 11 years, Partner Engineering and Science Inc. focuses on providing core engineering, environmental and energy commercial real estate consulting services. The company’s industrial hygiene team assists clients in the control of environmental and occupational stressors from the workplace, which may cause impaired health and well-being, or significant discomfort among workers or among citizens of the community. Where there’s smoke, there are going to be complaints. Odors and temperature are also key concerns for guests. “Moisture mapping identified water damage behind vinyl wallcoverings in nearly all the rooms of the hotel. This was causing a mildew odor, and there was visible growth on walls and, in some cases, carpeting and other surfaces,” he said. “After much investigation, the team identified the source of the problem as the packaged terminal air conditioning (PTAC) units within each room. The PTAC units had many maintenance issues, including lack of cleanliness, drain pans being pitched toward the rooms causing water to enter rooms, many of the small drain lines of the primary drain line system clogging, and other violations. Many of the PTAC units toward the end of their service life weren’t able to maintain relative humidity below 60%. An ounce of prevention is worth a pound of cure. To help clear the air, Jelin recommends taking action according to industry standards and guidelines; conduct routine HVAC and plumbing maintenance; develop and maintain a Legionella management program, as well as moisture and mold operations and maintenance; and reduce or limit smoking in the hotel facility to prevent introduction of secondhand smoke.